Pretty/ Punk. I created a soft feminine look with a strong eye to give it a pretty punk edge. I love the luminous clean skin, with the focus on the eyes. We created this using a full clumpy lash effect. For the eyes we used MAC fake lashes in Number 3, Black Track Liquid Eyeliner and lashings of the fabulous new MAC mascara, Haute & Naughty. For the creamy radiant complexion we used MAC Mineralise Moisture SPF Foundation with a hint of peach on the cheek and illuminator. On the lips we used MAC Clear Lip Glass. 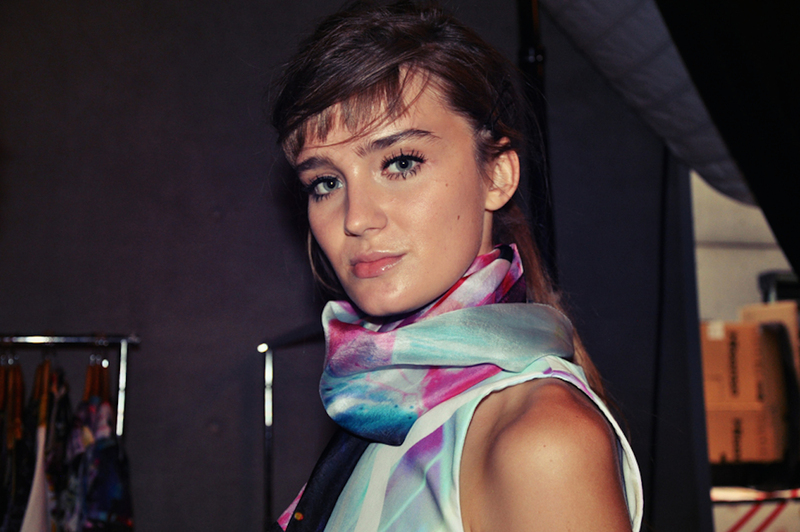 To create a flawless radiant complexion, prepare the skin with Prep & Prime Brightening Serum. It instantly brightens, smooths, firms and hydrates. It’s like preparing a canvas before painting. We applied MAC Luna and Hush Cream Colour Base to highlight cheekbones and a light dusting of peach powder on the apple of the cheek for a pretty “peaches and cream” complexion. 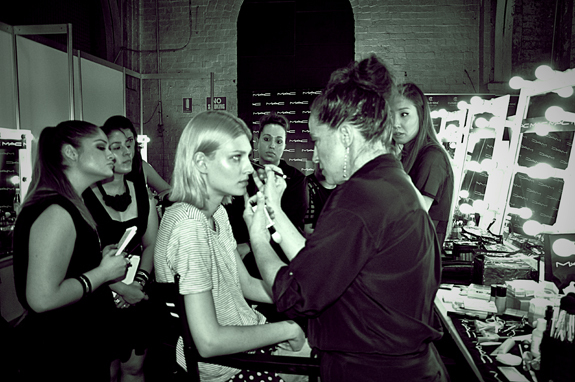 "Sarah is, without question, one of Australia’s top fashion hair and make-up artists. Her ability to create a flawless complexion combined with her creative interpretation of a brief is signature to her style and reflected in her work."